Our most recent project involved upgrading a 10+ year old TeleVantage Analog Phone system to a new ShoreTel 14.2 VoIP system. The old TeleVantage system was becoming more and more unstable. The old system gave the business several scares where the phones stopped working entirely. Replacement hardware for the system became very pricey due to its scarce availability. Replacement cards cost $2,000-$3,000 each, and the system had 2 cards that would need replaced. It made more sense for the business to upgrade the system, rather than investing in over-priced, antiquated hardware. Fortunately, we were able nurse the system along for about 4 months until we were able to install the new system. Towards the end of the 4 months, the fax-lines were dropping on a weekly basis, and the business was dealing with fax communnoication issues on a daily basis. It was definitely time for an upgrade. Let's walk through the project step by step. The networking infrastructure needs were being cared for by a D-Link 100Mb 48-port workgroup switch, and a 100Mb switch built into the firewall device. The clients were connected in the D-Link switch in the back of the office suite, and all of the servers, located in the front of the office suite, were connected to the mini-switch built into the firewall. Needless to say, the infrastructure was not prepared for a VoIP system. The business invested in a HP 2910al-48G-POE+ switch for the users, and a HP 2810-48G switch for the servers in the front of the office. Local network speed increased from 100Mb to 1000Mb, and the network proves much more reliable on the HP platform. The 2910al switch provides power to the phones, so no additional power bricks are needed for the phones. The next hurdle was the cabling in the office. During another project, half of the cabling already had been replaced because it proved unreliable. However, the other half of the cabling was original. Once a VoIP phone was plugged in, several network drops that were functioning with a computer connected, failed to provide power or failed to connect to the network. After running several new lines to offices that were having issues, we were finally able to get everyone's phone online and registered. At the beginning of the project, there only existed two physical servers. The first being the Windows Server 2008 R2 Domain Controller, and the second being their antiquated software-PBX running on Windows Server 2003. In order for us to install a solid VoIP phone system, additional investments needed to be made. Two (2) lightly-used Dell servers were purchased, and VMWare vSphere 5.5 was installed. A virtual Windows Server 2012 R2 server was created to build the new ShoreTel Shoreware VoIP server. New 2012 R2 domain controllers were built. The existing Windows Server 2003 PBX was decommissioned, and the existing Windows Server 2008 R2 was demoted from its Domain Controller responsibilities. The new phone system brought a lot of new features to the company that the whole staff enjoys. The most popular new feature is the IM client built into the ShoreTel Communicator application. The staff now has the ability to communicate within the office without using their phones or shouting from office-to-office. This feature is very useful when on the phone with a client, and the need to communicate with a coworker arises. The second most popular feature is the "Find Me" capability. If they step away from their desk, the phone system automatically attempts to call them on their cell phone, or other device that the user has configured. They can control this functionality manually, or have it synchronize to their Outlook Calendars. The Chief Accountant loves the call recording features. Within the first 2 weeks, he expressed how much he thought the new system was a good investment. He had already recorded several conversations he had with the IRS, and could not express enough how valuable this feature was to him. Three kinds of phones were installed. 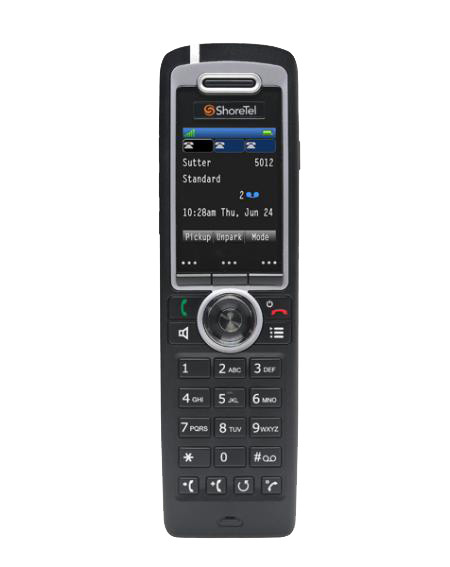 A high end phone (IP 655) for the executives and outside reps, a lower end phone (IP 230G) for the inside reps that don't use their phones often, and a cordless DECT phone (IP 930D) for the receptionist. This phone is gorgeous! The users often compare it to using an iPhone because it is touch screen, and very, very easy to use. Here are some pictures of the phone. Needless to say, the users who received these phones are absolutely in love with the new phone system. The "work horse" phone. This phone can do almost everything that the phone above can do, just it doesn't do it with as much style. Some features don't transfer over, such as the virtual voicemail, and it only has 3 programmable lines / action buttons. The receptionist received this beautiful color-screen DECT wireless phone. The range on this phone is great. She has the ability to roam throughout the entire office while still answering calls, and even transferring them to the intended recipient. She also is fortunate enough to have a IP 655 sitting on her desk. The old phone system was installed very sloppily. The phone patch panel was located in the server closet. Patch cables were left hanging and tangled with network and power cables. It was very difficult to trace the 2 fax lines that we had to preserve. The phone cables that ran to the offices were not documented, which made troubleshooting phone issues almost impossible without a toner device. Moving to a VoIP system, the phone patch panel was vacated 95%. Phone services are now provided via the networking cabling that terminates on the HP 2910 switch. Cabling in the closets literally has been reduced in half. Because the business was having a slow day, we cut over to the phone system during business hours around 4 PM. The new phone system worked instantly, receiving phone calls on the PRI and routing them accordingly. Absolutely no issues were experienced. The fax problems also disappeared after moving to the new phone system. All-in-all the new phone system purchase and installation was the right decision for the business.